"This is a family recipe that goes back more than 80 years. I have made modifications to this recipe to enhance the taste and flavor. 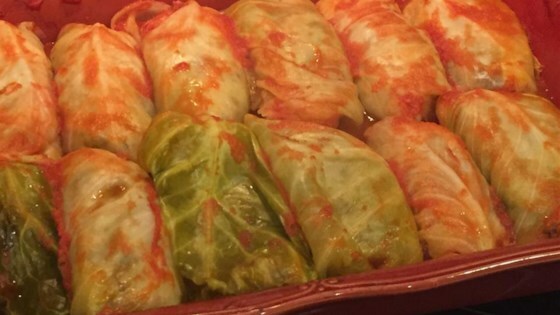 These cabbage rolls freeze well." Wash rice thoroughly. In a medium saucepan, combine 2 cups rice and 4 cups water. Bring to boil; reduce heat, cover and simmer for 20 minutes or until all of the water is absorbed. In the meantime, remove the core from the cabbages using a thin, long knife. Place 1 cabbage in a microwave proof container with a lid with core side down. Pour 1/2 cup water into the container with the cabbage, cover and microwave on HIGH (full power) for 10 minutes. Carefully turn cabbage over and cook covered for an additional 10 minutes. When cabbage is cooked, let sit until it is cool enough to handle. Separate leaves carefully, removing any tough ribs. Cook the second cabbage in the same manner. Divide chopped onions in half. Saute one half of the onions in 3 tablespoons butter; cook just until translucent (do not brown). In a large mixing bowl, mix together both the cooked and uncooked rice, cooked and uncooked onions, ground beef, pork sausage, garlic, dill weed, salt, black pepper and sugar and mix well to blend. Spoon about 2 tablespoons of mixture onto each cabbage leaf. Bring one end of cabbage leaf over mixture, roll and tuck ends in to prevent any filling from falling out. Preheat oven to 350 degrees F (175 degrees C). Prepare two 9x13 inch casserole dishes by placing some left over cabbage leaves in bottom of each. Arrange cabbage rolls in a single layer tight against each other. In a food processor or blender, process condensed tomato soup and tomatoes. Pour tomato mixture over the cabbage rolls until just covered. Place 4 bay leaves on top of sauce in each dish. Cover each dish tightly with aluminum foil. Bake in a preheated 350 degrees F (175 degrees C) oven for 2 hours. Once cooked, remove the dishes from the oven and let cool for 15 minutes before removing aluminum foil. Serve hot. Great recipe, I boiled my cabbage and through a bag of success rice in with it, when the rice was done the cabbage was ready. Super easy, real tasty and the family loved it.